Succulent plants are hot! That is to say, succulents are both popular and thrive in hot, dry conditions. Technically, succulents are any plants that have thick, fleshy leaves, stems and roots adapted to store moisture. This includes plants from places on the planet that never get really cold, and those from more temperate regions that go dormant in the winter and emerge in spring. Regardless of their origin and type succulents have bold and diverse foliage forms and colors, and are easy to grow requiring little maintenance—key elements for achieving impressive gardening results and success. In Chicagoland, cold-sensitive succulents, referred to as either annual or tropical succulents, can be grown in the sunny outdoors all summer in decorative pots and dish gardens and over-wintered indoors on a sunny windowsill. The diversity of available annual succulents is stunning, which makes them such fun to work with. You can combine textures and colors to create beautiful dish gardens or feature your favorite variety in its own pot. Annual succulents (to name a few) include Kalanchoe, Crassula and Senecio in a wide assortment of varieties. The key to annual succulent success is planting them in fast-draining soil that is designed specifically for cacti and succulents. Water generously and fertilize regularly during the spring and summer growing season, but allow the soil mix to dry between waterings. During the winter months in the indoor environment reduce watering to just once per month and don’t fertilize. Overwatering, which encourages root rot is the most common cause for succulent failure. Yes, you can literally kill them with kindness. Perennial succulents are well suited to the sunny garden and depending on variety can be grown as groundcovers or upright flowering features. Offering gardeners striking colors, diverse textures and heights, and an easy-care reputation, perennial succulents are an increasingly popular accent in the garden. 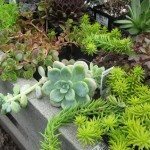 Perennial succulents for the landscape and outdoor containers include Sedum, also known as stonecrop, available in a wide variety of ground hugging as well as tall flowering types. The Growing Place is currently featuring more than a dozen groundcover Sedum varieties, with intriguing names such as ‘Dazzelberry’, ‘Pure Joy’ and ‘Voodoo’, as well as a broad selection of taller, flowering types. Also available are the very popular and cold hardy Sempervivum, commonly called hens and chicks. These perennial succulents come in a wide variety of colors and textures. Both stonecrop and hens and chicks are deer and rabbit resistant. Try expanding your gardening horizons with easy to grow annual and perennial succulent plants. Both The Growing Place locations will be hosting “Plant Succulents in Anything” hands-on workshops this Saturday, July 26. Stop by anytime between 12pm and 3pm. Learn more about annual and perennial succulents, and for only the cost of materials you can create your own succulent dish garden in our whimsical containers, or bring your own.